Do you ever wonder if your loved one is eating well while they're away? We designed these tasty snack boxes so that you can make sure they have the tastiest treats coming straight to their door anytime you want to send them a sweet little surprise. If you have a college student or family member in the military living away from home, sometimes all it takes to bring back the memories from home is a tasty snack from someone they care about. With our pre-packaged delicious snack boxes, you can easily ship a box of love their way to bring them back to Mom and Dad's or Grandma and Grandpa's house with just a bite of tasty food and a care package. If you're looking for something nice to do for a loved one that's going to bring a smile to their face, send them one of our delicious snack boxes and know that they won't be going to bed hungry. FANTASTIC FOR GIFT BASKETS - These snack care package boxes contain an assortment of 45 single serving snacks great for college care packages, Anniversary, military care packages, camping snacks, back to school supplies and school snacks, finals week care package, housewarming gifts, corporate gifts, quick appetizers, yummy snacks for school lunches, snacks for work, vending machine snacks, movie snacks, airplane snacks, or even preparation for road trips! FRESH FOOD FAST, GUARANTEED - All of these delicious individually wrapped snacks are guaranteed to have expiration dates at least 50 days out so you'll know whoever receives it will be eating premium quality food that tastes super fresh! The best college gifts don't always have to be college dorm room accessories - give the gift of study snacks with this college survival kit! ONLY NAME BRANDS YOUR TASTE BUDS TRUST - This 14"X10"X4.5" package includes 45 of the tastiest individually wrapped single serve name brand snacks we could find! This tasty treats snack set includes a perfect mix of sweet and salty flavors to win over even the hardest to please taste buds. SAVE TIME - Save yourself the trouble of finding good snacks at the grocery store, boxing them up, and then fighting your way through the post office to send your care package ideas out. Bypass all of this with the simple click of a button and your loved one will have a snack box at their door in a fraction of the time it would have taken you to do it all yourself! QUICKLY SHIPPED BY AMAZON -Few things are as important as making sure your loved ones are eating well when they are far away from you. Snack boxes make the best gifts for college students or military care package ideas. 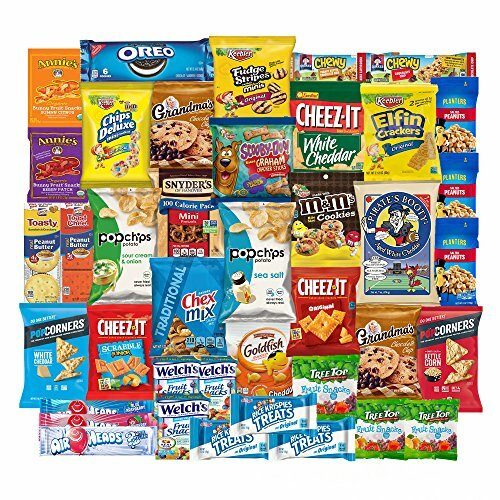 Take advantage of Amazon's guaranteed rapid fast shipping and send them a box of prepackaged snacks so they know you are always there for them no matter how far away they are. You can even leave a gift message or add a gift wrap at checkout! If you have any questions about this product by SB SnackBOX, contact us by completing and submitting the form below. If you are looking for a specif part number, please include it with your message.